Before our final group dinner, I had never heard of Shabu Shabu. 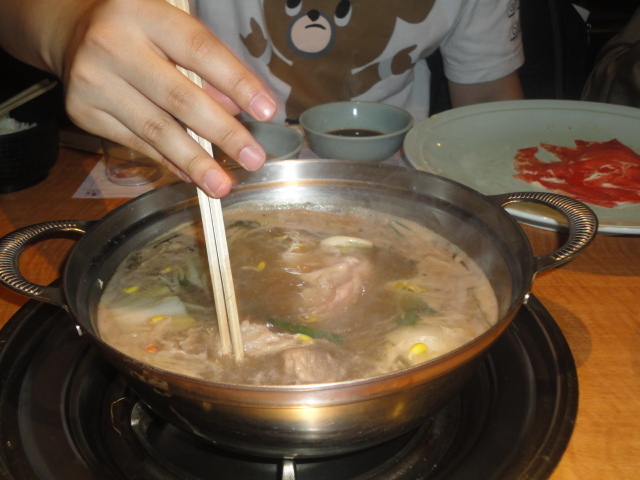 It is simply the boiling of meat, vegetables, and noodles at a temperature so high, it cookes completely immediately. The meat was very good with the tartar sauce, which I had never tasted before. It was decent with the soy sauce as well, but was better with the tartar sauce. I preferred the beef to the pork because the pork still had fat on it, but both were still very good. Of course, the rice was good as well. Cultural story of the night: I asked the waiter for water in Japanese and his response was “Water” in a tone that made me feel like he responded “Hey, I KNOW HOW TO SPEAK ENGLISH!” It was hilarious. Not my fault he didn’t make it clear he spoke English. The restaurant itself was the perfect setting, especially at night.